Earning your master’s degree is a big decision and rightfully so! You are committing to a sizable investment of hard earned money and precious time. But not all online graduate programs are equal. There are several key components to take into consideration when choosing the right program for you. Some, like price, might seem obvious, but there are other important pieces of the program that deserve attention, too. 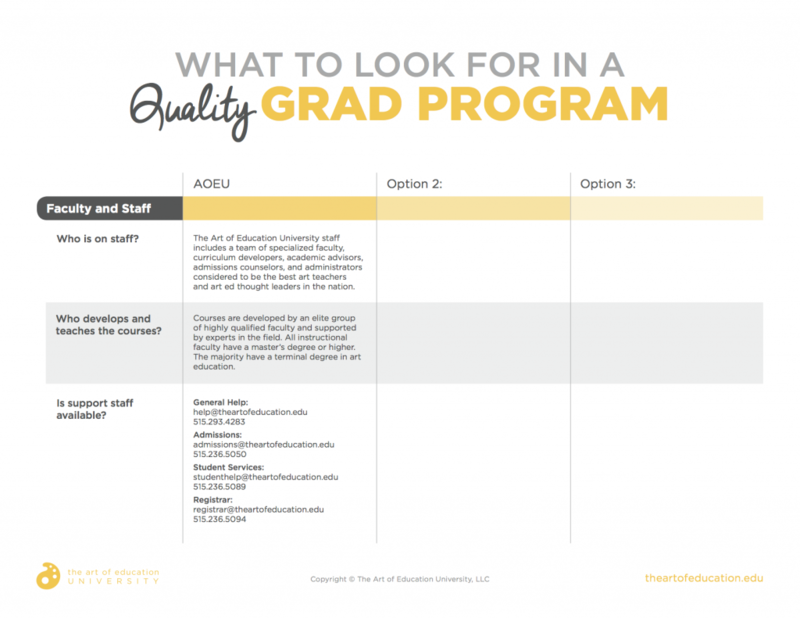 To help you compare programs as you search for the right fit, we have included a downloadable chart with key components, questions to ask as you research, and blank spaces to record notes. Consider this your first graduate level assignment! Questions to ask: Who is on staff? Who develops and teaches the courses? What student supports are available? Faculty and staff can make or break any program. As you compare, be sure to look at credentials for instructors teaching courses. A master’s degree is required to teach graduate level courses, but there should also be a good number of terminal degrees (MFA, Ed.D, and Ph.D.) on staff. Pay attention to staff specialties and interests. Do they align with yours? Look to see what kind of interactions you can expect and details on who is actually instructing the courses. Are they taught by teaching assistants only? Are there guidelines for how often faculty interacts with students? Whatever you do, do not overlook student services! Do they have Academic Advisors to guide you through the program? Are they easy to contact? Can you pick up the phone and actually get a human voice on the other end? Do they return calls and emails in a reasonable timeframe? A top-notch program will have qualified instructors assigned to each course. The course size will be small and manageable. Instructors should be required to respond to assignments within a reasonable timeframe. And instructor feedback should be well-developed, thoughtful, and specific to each student. No one wants to spend hours on an assignment and then get a virtual “thumbs up” or worse, a canned response from the instructor. You deserve more. 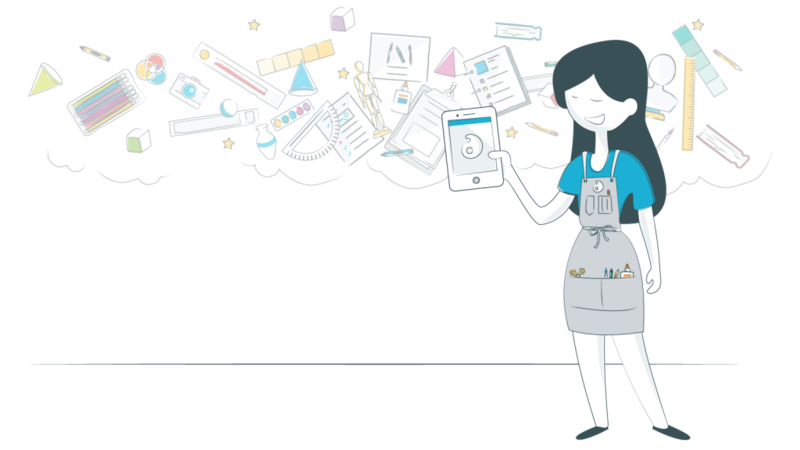 At The Art of Education University, qualified faculty (not teaching assistants) read and respond to every single assignment within 48 hours of the due date. We have 25+ instructional faculty on staff, the majority of whom hold terminal degrees in the field of art education. AOEU courses are developed by an elite group of highly-qualified faculty members and supported by experts in the field. We never write a course in a bubble, but instead harness a specialized cohort plus our graphic design team, videography team, and subject matter experts from across the country. AOEU also employs a fantastic team of professionals, like Admissions Counselors, Academic Advisors, and Customer Engagement Specialists who are real human beings ready to chat, text, call or even schedule a 1:1 virtual meeting with you. Questions to ask: How is the program accredited? What type of accreditation do they hold? There are three major types of institutional accrediting agencies in the United States: national, regional, and specialized. Accrediting agencies are regulated by the U.S. Department of Education. When reviewing programs, you will want to know through which agency the program is accredited and what type of accreditation they hold. You can click here to search a list of approved institutional accrediting agencies. Once you have this information, you will want to cross-check it with your state requirements for re-licensure. If you are interested in earning your master’s degree and using these credits to renew your teaching license, this step is imperative! Some states accept both regional and national accreditation. Others only accept one or the other. If you aren’t sure where to begin, check out our interactive map for state-specific requirements. We always recommend contacting your district to confirm approval. A quality program displays clear accreditation and can answer questions on the topic, so you feel 100% secure before you sign up. At the Art of Education University (AOEU), the Master of Arts in Art Education degree, and all individual AOEU courses are nationally accredited by the Distance Education Accrediting Commission (DEAC). AOEU students also have the option to elect to receive graduate credit for individual AOEU courses from our educational partner, Morningside College. Morningside College is regionally accredited by the Higher Learning Commission (HLC). This means no matter what your state requires; we most likely have you covered. Best of all, if you are feeling even the slightest bit unsure, our Admissions Team is only an email or phone call away. They are extremely knowledgeable and standing by to help match your needs to our offerings. Questions to ask: What is the cost per credit? What other fees are required? What is the payment schedule? Can you explain the tuition reimbursement and withdrawal policy? There is no denying that price is an essential piece of this puzzle. An investment of this magnitude requires a firm grasp of all the financial pieces at stake. It is important to understand the tuition costs, payment options, financial aid opportunities, and tuition reimbursement. You might also ask what happens if prices change. If tuition increases one month into your program, for example, are you locked in at the old rate or bumped up to the new? A quality program is 100% transparent when it comes to all program expenses. Policies should be clear and easy to understand, stated on the site, and part of the admissions process. At The Art of Education University, all our policies are publicly posted online along with detailed information about tuition and fees. Our Master of Arts in Art Education degree costs $13,314 + books/materials making it one of the most cost-effective master’s degree programs available in art education. Enrollment is flexible and continuous with monthly course offerings, so no payment schedule is required. And AOEU offers 100% withdrawal, transfer, or tuition reimbursement for any course, for any reason, as long as the request is processed before the course end date. Questions to ask: What are the program requirements? How often are courses offered? Is there a specific timeline? Do courses have to be taken in a particular order? It is essential to understand the program specifics. Look to see if the program is one-size-fits-all or if can you customize it to meet your needs and interests. You will also want to learn about any nuances of the program. Is there a culminating event, such as a Master’s Thesis or Capstone Project? Are these items online or in-person? How often are advanced courses offered? It would also be a good idea to get an understanding of the student experience. Online learning gets a bad rap when students feel disconnected, but it doesn’t have to be this way. Learn how the program humanizes the learning experience and connects you to other students and faculty. Last, make sure you understand the fine print. In case of emergencies, you should know how long you have to complete the program and whether or not you are allowed to pause your learning. A quality program shares all of this information with prospective students well before the application process. They have FAQs and staff poised to answer your questions. Red flag: if the institution feels cold or disconnected to prospective students, program students will likely feel disconnected, too. 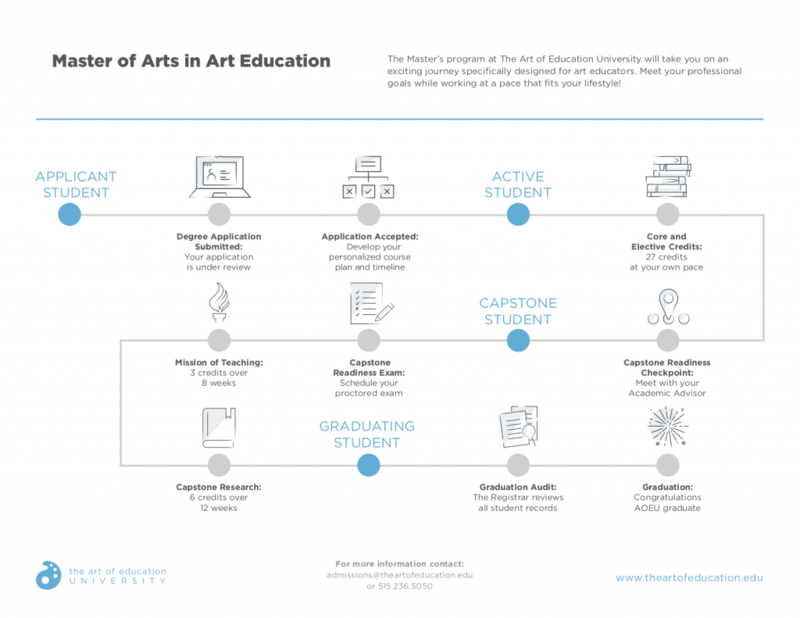 As you can see in the image below, at the Art of Education University, we believe the master’s degree experience should be tailored to each student. This philosophy includes flexible timelines, a customized master’s degree plan, and rolling enrollment with courses starting every month. Our master’s degree page provides everything you need to learn about the program requirements, proctored exams, degree policies, and courses – including the Capstone Research Project. Still have questions? We have Admissions Counselors ready to give you the answers (and the time) you deserve. Now that you know what to look for, it is time to dive in and start comparing programs of interest to you. As you research, keep in mind that this is an opportunity for you to grow as a professional and a person. The program you select should fit your needs, wants, and desires! Earning a master’s degree is no small task, so take time to choose the best one for you—you deserve this! What do you look for in a quality online graduate program? The post What to Look For in a Quality Online Graduate Program appeared first on The Art of Education University.